In 1936, Richard Daley was a 34-year-old lawyer and secretary to the Cook County treasurer. In October of that year, a candidate for state representative in Daley’s district died 15 days before the election. Daley mounted a quick write-in campaign and won. Later that year, the deputy Cook County comptroller died, and Daley got the job. Two years later, the state senator from the Bridgeport area died. Daley was elected to that post and rose to minority leader. Then, 12 years later, the Cook County clerk died. Daley’s election to that job put City Hall within reach. After three years as county clerk, Daley saw an opportunity to get one step closer, when the chairman of the Cook County Democratic Party resigned, unleashing a bitter fight between party factions. And once again, Daley’s ambitions got a little help from fate. “Daley at that time made a move to be chairman and he was stymied by an alderman by the name of Clarence Wagner,” said longtime Chicago Ald. Seymour Simon, in a 2005 interview with Chicago Tonight. But in 1953, Wagner died in a car crash on a fishing trip in Minnesota and Daley succeeded him. As chairman of the Democratic Party, Daley was in an ideal position to make his move for mayor. 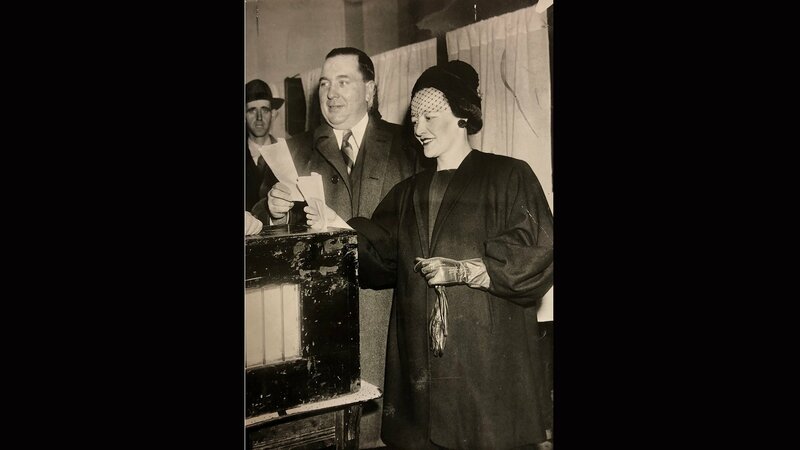 Chicago Mayor Martin Kennelly was up for re-election two years later, in 1955. The good news for Daley was that many in the party were unhappy with Martin Kennelly. The Democratic Party had backed Kennelly in his previous elections. In December 1954, he came to party headquarters at the Morrison Hotel to ask for their support again. Daley was not on the slate-making committee, but had appointed the members and sat in on the proceedings. Kennelly spent less than 5 minutes in the room. By the end of the meeting, it was clear to him that he didn’t have a chance. And Daley was coy about his own intentions when interviewed by a WGN TV reporter. Reporter: Have you announced your candidacy for mayor, sir? Reporter: Do you expect to appear before the committee of which you are a member? Daley: If the committee sees fit to hear me, yeah. I’d be more than happy. Reporter: As your intention of running for mayor? Daley: Well that would be up to the committee. Kennelly would not go without a fight. He mounted his own campaign as a Democrat, with no support from the party. Kennelly had the support of many prominent Chicago leaders. The Chicago Tribune was strongly in his corner, regularly portraying Kennelly as a hero taking on political corruption and crime. But in the neighborhoods, the Democratic Party’s army of precinct workers would be working for Daley. And, many of them thought, fighting for their jobs. In the primary and later in the general election, Daley’s detractors viewed this election as nothing less than a battle for the soul of the city. And to respond to the charge that he was power hungry, Daley pledged that, if elected, he would step down as chairman of the party.